Soon after we were married in Sri Lanka, my husband and I went shopping to a grocery store operated by a local farm. This particular store had an assortment of vegetables, both local and foreign, so we would spend quite a long time trying to decide what we would take home for the week. Since I never really spent much time in the kitchen prior to marriage, I wasn’t familiar with some of the produce on display. While we were debating on which ones to take and others to leave for our next visit, I came across a dark green leafy vegetable, with thick pale green stems that I had never seen before. I pointed it out to my husband and asked him what the unusual vegetable was. He couldn’t recall the name, but he told me that it was served in Chinese restaurants in Australia, and that he had eaten a dish of this leaf prepared with Soy sauce in Melbourne, when he was studying there. He warned that it could get unpleasantly bitter if not cooked properly, but when it was prepared by an experienced chef, it would be an excellent accompaniment to a dish of Black Bean Chicken or Hot Garlic Prawns! That did it. I was hooked and I bought a bunch of the leafy vegetable to give it a try. 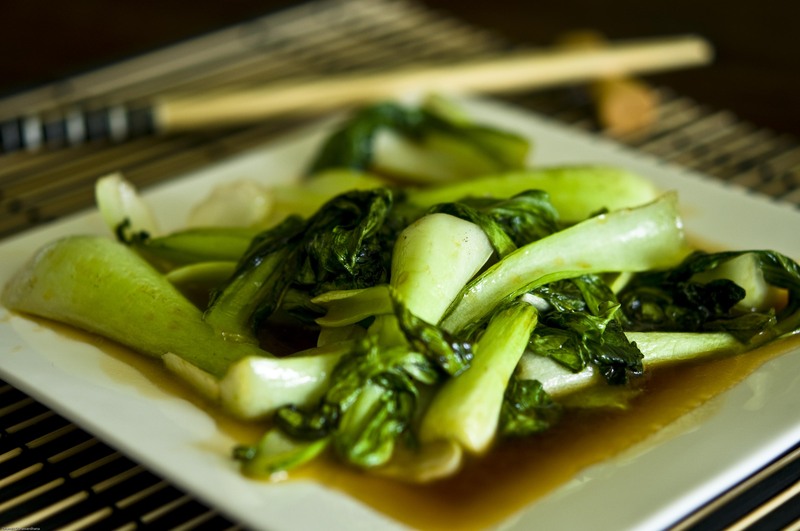 Bok Choy sauteed in Soy Sauce has become one of our favourite side dishes. Bok Choy is also a great way to get lots of vitamin C, calcium and vitamin A and it contains glucosinolates, which some claim to have cancer prevention properties. Health benefits aside – it tastes great!